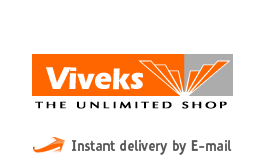 E-Gift Cards from VIVEKS - The best known- "Family" Electronics Retailer in South India, now goes high tech with the launch of their Exclusive E-Gift Cards. Vivek's has always been a trendsetter and now , a wide choice of products, consumer electronics, household appliances await you in their shops across all of Southern India. The perfect gift for that start up home-maker, that friend's wedding, anniversary or birthday. Vivek's has the perfect electronics gifts for every occasion. 3. This e-gift card is not redeemable against purchase of mobile phones. 4. This is an e-gift card. This card can be redeemed just once. 5. This e-gift card is solely for the use of purchasing merchandise at participating Viveks exclusive stores only. 6. There is no extra fee to obtain this E-Gift Card. 7. This E-Gift Card is not redeemable for cash or credit. 8. Please present this card to the customer representative before billing. 9. Protect the card numbers and pin numbers to avoid misuse. In case the card number gets stolen, it cannot be replaced, nor cash refunded.